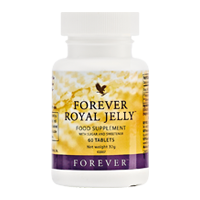 Forever Royal Jelly is made for royalty! Natural royal jelly is an extremely nutritious and biochemically complex honey bee secretion. It’s a rich, milky substance which consists of proteins, simple sugars, fatty acids and trace elements vitamin B5 and B6. The exclusive food of the queen bee, royal jelly is thought to be responsible for her longevity – she lives over fifty times longer than regular worker bees! Sweetener (sorbitol), fructose, royal jelly, acidity regulator (citric acid), natural orange flavour, anti-caking agent (stearic acid), stabilizer (magnesium stearate), anti-caking agent (silicon dioxide). Warning: Keep out of reach of young children. Store tightly closed in a cool, dry place. Do not use if seal under cap is broken or missing. Food supplements should not be used as a substitute for a varied and balanced diet and a healthy lifestyle. Excessive consumption may induce laxative effects.